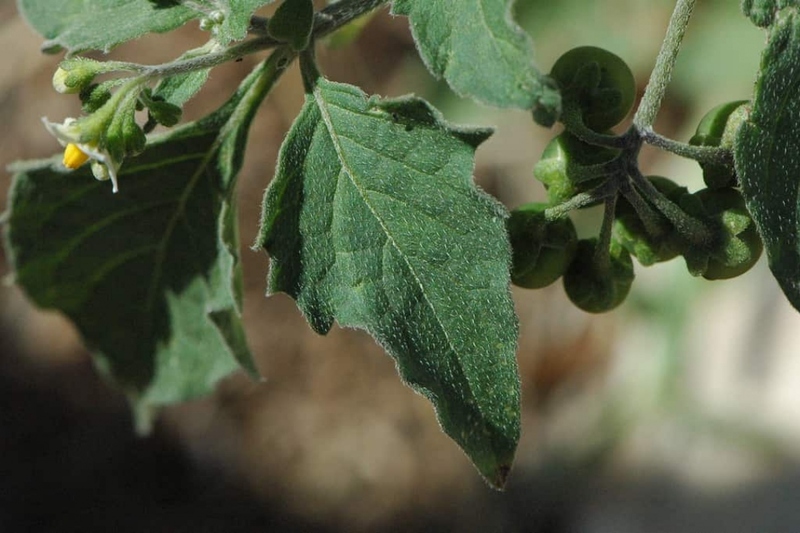 European black nightshade (Solanum nigrum): identify and learn about your plants with Groww. Solanum nigrum -European black nightshade - is a species in the genus Solanum, native to Eurasia and introduced in the Americas, Australasia, and South Africa. It is also known as black nightshade. Parts of this plant can be toxic to livestock and humans. Black nightshade is a common herb or short-lived perennial shrub, found in many wooded areas, as well as disturbed habitats. It reaches a height of 30 to 120 cm (12 to 47 in), leaves ovate to heart-shaped, with wavy or large-toothed edges. The flowers have petals greenish to whitish, recurved when aged and surround prominent bright yellow anthers. The berry is 6 to 8 mm, dull black or purple-black. Sometimes S. nigrum is confused for the more toxic deadly nightshade, Atropa belladonna, in a different Solanaceae genus altogether. A comparison of the fruit shows that the black nightshade berries grow in bunches, the deadly nightshade berries grow individually.